Forgot to post this one a while back in the fall. Shot by my son. Obviously some, shall we say, luck, but he is a phenomenal shot with his SIG. He shot from prone, lying in the back of a pickup while 2 buddies spotted. First shot was high. I forget his range estimate, but it was very close. They saw the strike and he adjusted for it and at the next shot the critter disappeared in the grass. His buddy who was spotting couldn't believe what he saw. "You SHOT IT!" Stuck it in the ear. We take only absolute dead to rights shots on noble game, but on the gang bangers of the woods, any hit is cause for rejoicing. My son carries his SIG every day and because of his work has opportunities to use it at targets of opportunity. we use our pistols on all sorts of critters; ground squirrels, grouse, snowshoes, etc. His 2022 has a really superb trigger pull and that helps. 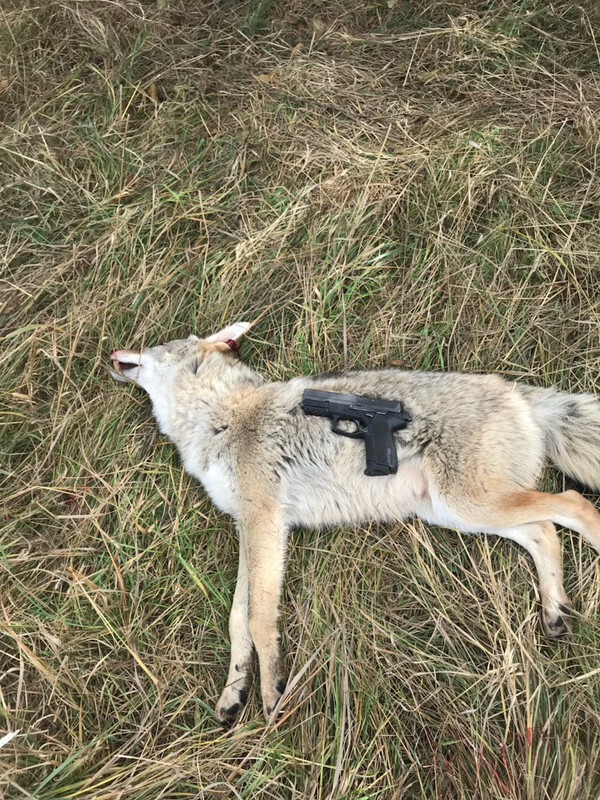 A while back he shot a coyote at about 40 yards and I thought that was a poke, but this yote takes the cake! I'd understand if he'd used a model 29 4". 184yds. is a REALLY good poke for a 9. This is not meant to take ANYTHING from him. An EXCELLENT shot indeed. Just stroking Art a little bit. I can almost feel the love.. Seriously, THAT is one hell of a shot..I do some shots everytime I go to the outdoor range at longer distances..usually stopping at 100yrds.. figure that is as far as I would ever shoot.. I have quite a few Sigs, both the newer generations and some like this..but have to admit, use various models anymore for practice--Glock, H&K, Walther, CZ.. like them all..rarely shooting any of my wheel guns anymore..like the higher capacity as multiple attackers seem to be the new way of attacking anymore... so practice for that scenario..having said that, and yes Daryl, this is the proverbial olive branch for you , one hit from a Model 29 is an immediate game changer.. Shot a jackrabbit years ago at 142yards--with my 8" Colt Python..like your son, 9.3, I carried that thing everywhere for a while...but this puts my shot to shame..YOUR son is to be commended..great shooting..and yes, when it comes to these guys and wolves, any shot is a good shot..
Those are seriously long game shots. Used to practise out to 300 meters quite regularly with my S&W 4", .44. We had a sheep silhouette on that range's bank, making a good target. I guess the actual range was about 305/6 meters. That's roughly 335 yards. It was a good poke. Elmer told me it was "good practise" with a 44, especially if ever I "need to take care of business and don't have a rifle." Got that bit of wisdom from him in a phone call when I wore the uniform. So, long range pracitse can pay off. Wow, that is some shot, awesome really, I think a lot of skill & practice involved !! I shoot a Goose in the head at 75ish yards with a Ruger Single Six with the 22mag cylinder installed but that was 90% bad luck for the Goose ! Missed a lot of Bunnys at 25yards lol ! Back in Kentucky in '87 or '88 I shot a groundhog in the head as it peeked over it's hole at 60 honest paces with a Ruger Single-Six w/ the .22 Mag cylinder in it, so I have no doubt you did it, Sarg! We use our AR15's for ground squirrel shooting and shoot a lot of them with the Ar's, and we have a standing joke about misjudging the scope line over the bore at bayonet range...too many misses there! Friend of mine in West Yellowstone took this when he got to work. 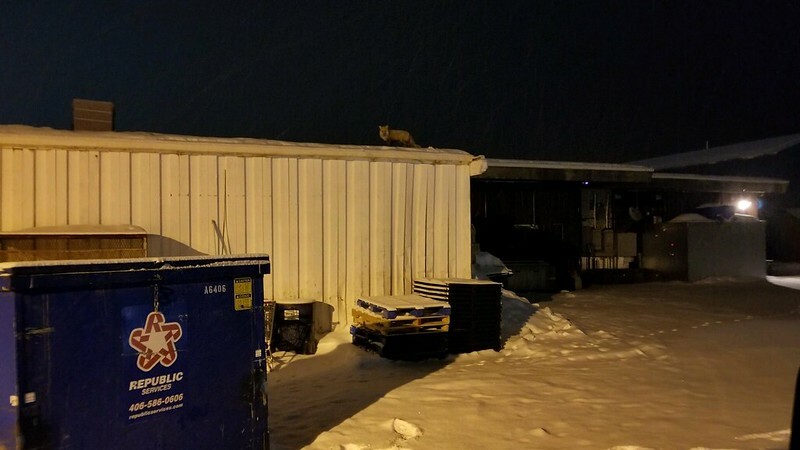 Fox is on the roof of his grocery store... apparently needs to get in on the sale.. I tried to find the video that is not FB related..but did not find it...so if you are not using FB you probably won't get this..sorry... pretty cool..Huge herd of elk in the Madison Valley..
Holy crap that's a lot of ELK! Elmer used to say "hitting at long range with a handgun was purely accidental, but if you practiced at long range with that handgun, you'll have more long range accidents than someone who didn't". He came out with that when the, as he put it, "The Askin's Tribe" "started riding me" about the mule deer he shot with the first 4" .44 mag from S&W and the first box of Rem 240gr. G/C bullets. The judge was with him - somewhere around 600 yards he'd guessed IIRC - or was it 450? 450 would not be difficult due to the short barrel and tall front sight. To shoot at 334yards (approx), I only needed the bottom orange plastic level with the top of the rear sight. Holding on that line gave an easy sight picture. That gave the other 1/2 of the sight to be held up for longer range. I only ever shot mine to the 334yards or 305 or so meters. With longer barrels, more sight has to be held up. I spent an afternoon with Bob Hagel in Salmon, Idaho with my then small son. Bob was as you remember a good friend of Elmer's and Elmer sort of raised him in the woods and taught him a lot. I asked Bob about that shot. "But Elmer was the best pistol shot I've ever seen. One day we were riding and spooked a grouse that flew across a meadow and landed at the treeline. Elmer drew his 4" Model 29 and right there while sitting in the saddle said he saw where it landed and stopped. He thumbcocked the gun and calmly took aim and broke the trigger. he then reholstered the wheelgun and calmly took up the reins again and said 'I got it', then turned his horse and walked her over the meadow and offsaddled to pick up the dead bird. I paced the meadow and it was over 125 yards. He was a very good shot." I am convinced that taking shots of opportunity with a constant companion reduces the "luck" involved and on some shots few are capable of, eliminates it entirely. But still one is faced with the mechanical accuracy of the gun, and that alone adds a dimension of chance to any long shot. My son who I've mentioned before is one individual who shoots far less than many guys I know who shoot competitively but I can't really name a single one that can outshoot him on woods critters and such. It's a different game for sure. By the way, the whole town of salmon was then full of people that would tell all sorts of funny stories about Elmer. I had some long chats with people about his antics in town. He was quite a character! I treasure my talks with Keith, although too few & only a few. I still have my correspondence from Elmer as well as some letters from P.O.Ackley. I wrote Parker O. about the .458 2" data he had in book #1 being low in speeds to what I had chronographed myself and that I had gone on to develop some really impressive loads with powders available, even though I did still had a few cans on HiVel 2. He asked me if I would be so kind as to send him my data for book #3 that was reaching completion and I complied. He wrote that not very many people had their own chronographs at that time & congratulated me on working on that ctg. He thought it would be one of the best for heavy game in N.A. as Frank Barnes had wanted it. A month of two later, I learned of his passing on. Shortly after Parker died, I had heard that book #3 would be published, but I have not seen it. Wolf taken in Montana earlier this week..
That's a good one! The black phase make really nice targets in the snow. YES, but the lighter ones give a nice contrast with the crosshair.. WOW!, thats a Big pup! Good moose - long points and large paddles for that sub species. 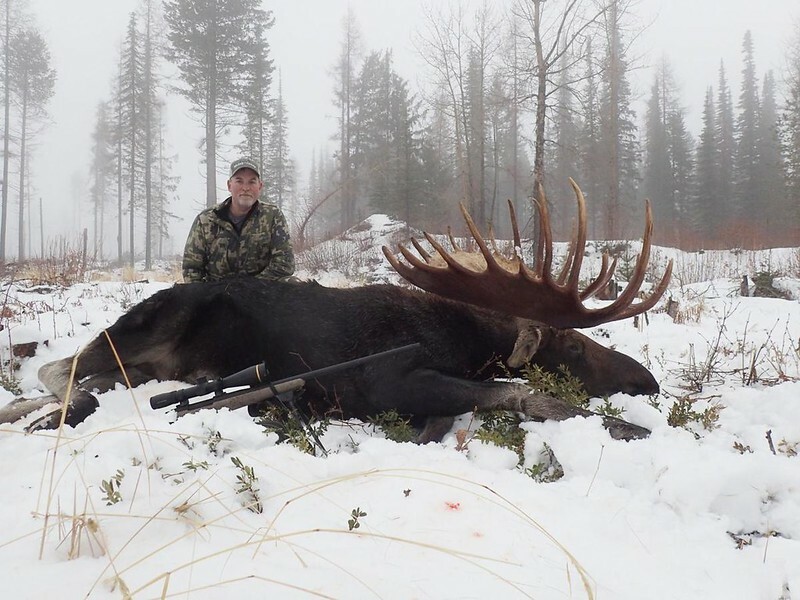 700 is large, seems to me, for a Shiras moose. It appears to be a good one, though. The hunter, being some distance behind the moose, makes it difficult to just body size, too bad - hard to judge the actual size. Note the size of the rifle.